Last year when Ancestry.com released the US Social Security Applications and Claims Index, I finally found the record that solved one of the biggest mysteries of our family history: “What happened to Alfred Ward?” None of us knew where he went after 1923. We thought he died shortly after this. 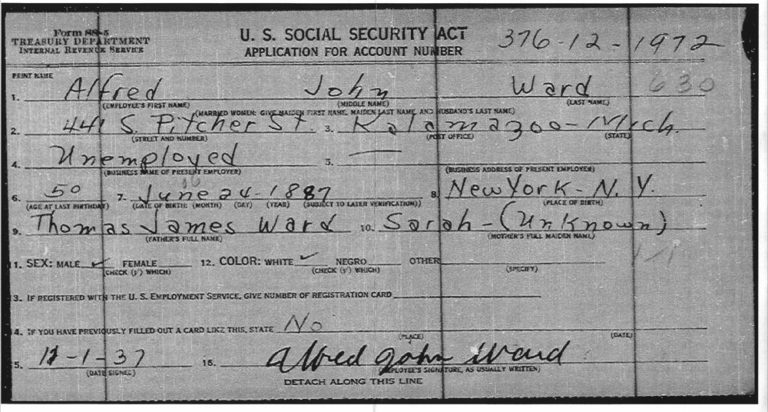 The index on Ancestry.com said: Alfred John Ward, white male, born 24 Jun 1887 in New York, NY, parents Thomas J Ward and Sarah.23 Aside from the birth year and place, it matched Alfred’s details. I ordered the full document from the Social Security Administration. When the record came in the mail, I was glad I took the chance and ordered it. 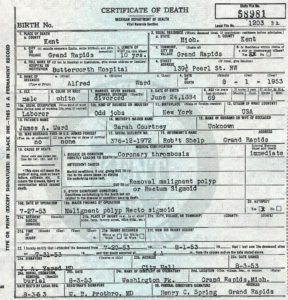 The signature on the form was identical to Alfred’s on two other documents. It also had information that was not in the index. He was unemployed and living at 441 S Pitcher St, Kalamazoo, Michigan. A quick city directory search told me this was the Kalamazoo County Michigan Transient Bureau. He was homeless. The year was 1937, during a recession in the midst of the Great Depression. 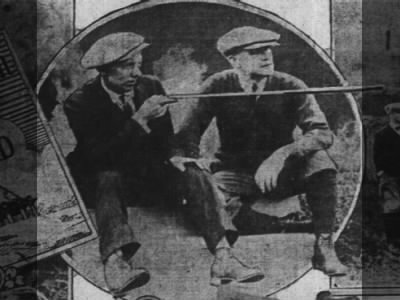 Many otherwise employed men were without work. Meanwhile, Alfred’s 16 year-old son James was working full-time, supporting himself and his elderly uncle. James’s mother had died the year before and he stepped up to be the breadwinner. There is a sad irony in viewing this record now, knowing the situation of all parties in the family. If Alfred had not deserted his family 14 years earlier, he would not have been homeless and without support. Alfred started listing his place of birth as New York instead of England in 1937, when he filled out his Social Security Application. I believe this was because he never completed the naturalization process. I found his Declaration of Intention filed in Monroe County, Indiana in 1923 but there was no subsequent Petition for Naturalization.26 His last entry into the USA was as a non-immigrant alien.27 This may have created problems for him becoming a citizen. For some reason unknown, he claimed to be a native born US Citizen although he clearly was not. 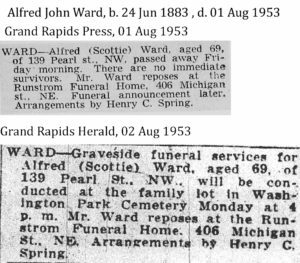 Alfred Ward died on 1 Aug 1953 in Grand Rapids, Michigan.28 He was buried in an unmarked pauper’s grave in Washington Park Cemetery. His obituary and funeral notices appeared in the Grand Rapids Press and Herald. It says his nickname was “Scottie” and that he had no immediate survivors.